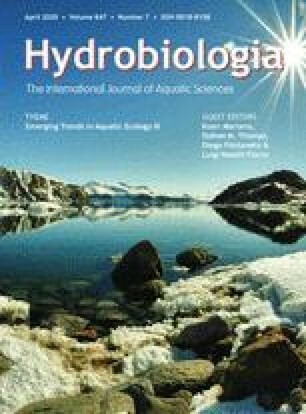 This study reports on the density, growth, and production response of the dominant black fly, Prosimulium martini, to whole river fertilization of the Kuparuk River in arctic Alaska during the summer of 1984. Beginning in 1983, a long term study of fertilization effects was initiated in the Kuparuk River. Increased nutrient supply stimulated algal and microbial biomass and microbial activity, which in turn affected the larval growth and abundance of Prosimulium. This experiment allowed us to isolate the effects of nutrient supply from other factors in determining black fly growth and abundance. Phosphorus addition had the following indirect effects on Prosimulium: growth was higher, but abundance decreased in the enriched section, leading to a net decrease in secondary production from 2.62 g m−2 yr−1 to 0.77 g m−2 yr−1. Prosimulium emergence rates were not measureably affected. The decrease in abundance and production appears to be a result of competitive displacement by the caddisfly Brachycentrus americanus which increased in abundance in the fertilized section of the river.